Become a Real Life Princess - Party Entertainers Needed! 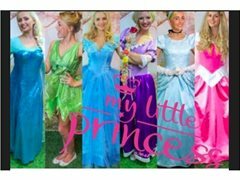 Become a real life princess!! Entertainers wanted to host children’s birthday parties and events all across the midlands. Lookalikes wanted for face character roles. Weekend work on a part time basics. Bring these much loved characters to life and make dreams come true. MUST have Full driving licence, car, and be confident to drive up to two hours away.